Telangana Open School Class 10th of SSC Time Table 2019 for TOSS 10th Time Table 2019 with subject wise Annual final public exam dates for October to November Session TS Open 10th Time Table 2019 Subject Wise Exam Dates by Telangana Open School Society…. The Telangana State Department of School Education and Telangana Open School Society is announced the state Open 10th Exam dates 2019 for October to November Session at their official website, and the TS Open School Society has scheduled the TS Open SSC Public Exam Dates 2019 from last week of October and the Public examination tests are closed on 2nd week of November 2019 at all centers across in the state. We wish to Inform the TOSS SSC and Inter October Public Examinations Tests 2019 are Scheduled from 24th October to 10th November 2019 and the time of Examination are 9:30 AM to 2:30 PM. 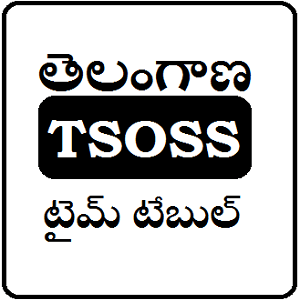 According to the Telangana Open School Society announcement the TS Open SSC Time Table 2019 is published from the following table for October Session Exams, all the TOSS class 10th standard students can follow the Open 10th exam dates for annual final public examination tests of Telangana Open School Society SSC October Exams 2019. తెలంగాణ స్టేట్ డిపార్ట్మెంట్ ఆఫ్ స్కూల్ ఎడ్యుకేషన్ మరియు తెలంగాణ ఓపెన్ స్కూల్ సొసైటీ వారి అధికారిక వెబ్ సైట్ లో అక్టోబర్ నుండి నవంబరు సెషన్ వరకు రాష్ట్ర తెరువు 10 వ పరీక్ష తేదీలు ప్రకటించబడ్డాయి మరియు TS ఓపెన్ స్కూల్ సొసైటీ TS ఓపెన్ SSC పబ్లిక్ పరీక్షా తేదీలు 2019 షెడ్యూల్ చేసింది అక్టోబరు పబ్లిక్ పరీక్ష పరీక్షలు 2019 రాష్ట్రంలోని అన్ని కేంద్రాల్లో జరుగును.